Exhaustsystem set for Trabant 601 two stroke engine made of stainless steel. Please note: the surface is not like at the picture. It is stainless steel matt / lackluster. Shipping only with additional fees for bulky goods. Exhaustsystem set for Trabant 601 two stroke engine. The manifold will be cleaned up by washing and checked for cracks. We offer only original mainfolds. 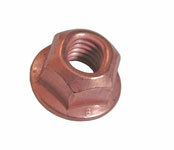 Secure nut for the Trabant manifold. Surface is plated with coper. Use for mounting without washer. 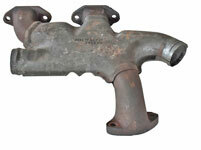 The rubber hose fit to all Trabant 601 (from november 1976) with exhaust manifold heating system. Exhaust manifold seal for all Trabant 500,600 und 601 two stroke engine without vintage limit Limousine and station wagon.